Click for a recording of today's Sola Devotion. What is able to set you free: human traditions or the Word of God? Abide in one and lack assurance and peace. Abide in the other and know “perfect peace” (Isa 26:3). Keeping traditions will have you forever doubting that you have ever done enough to be forgiven and go to heaven. If you want assurance of the forgiveness of your sins, and would enjoy the fellowship of God in heaven, then keep your mind, trust, and faith in his Christ, who has fulfilled all rules and regulations (Matt 5:17). Jesus Christ is the end of the law. He is the righteousness of all who believe in him (Rom 10:14). 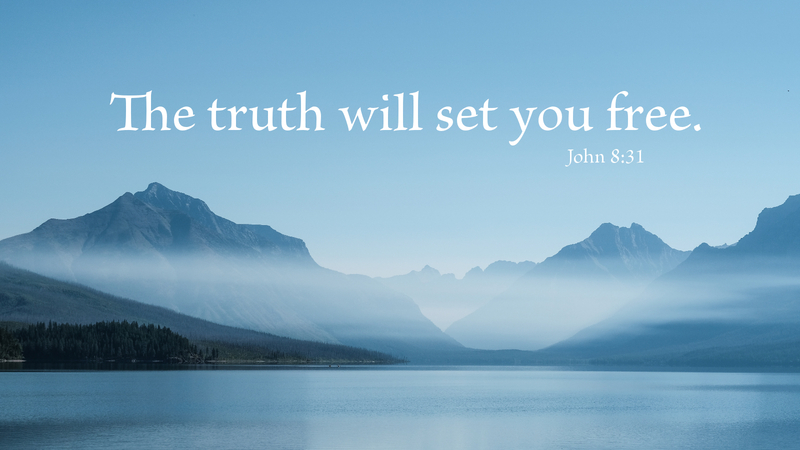 Believe in his righteousness instead of your own, and be freed. Prayer: Keep my mind stayed on you, Lord, and thereby, keep me in your perfect peace. Amen. 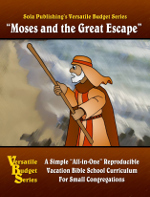 The biblical focus in this five-session VBS book, Moses and the Great Escape, is found in the Old Testament book of Exodus. God has a grand plan for humankind — a plan he enacts through the Hebrew people. He created Moses to be instrumental in this plan. Sola’s Versatile Budget Series is a simple and flexible educational Vacation Bible School curriculum designed especially for small churches, house churches, and mission congregations. The flexible format works well for groups with limited budgets, or in situations where the ages and number of students may vary from session to session. Unlike more elaborate and expensive VBS kits, this book is meant to serve as an “all-in-one” teacher’s resource. The worksheets and handouts it contains can be reproduced according to local needs. Each book in the Versatile Budget Series focuses on a particular character from the Bible, bringing together several stories on a common theme. Resources and ideas are provided for gathering time, music, activities, games, and refreshments — allowing just a few adult leaders to host a week of Vacation Bible School. During the month of December, we are letting the public see a sample of the site for free, including weekly planning sheets, inserts, text studies, children’s page, bulletin templates, hymn arrangements, and standard liturgies and orders of service. Beginning in January 2014, subscribers will have access to the full site and all of its resources. Call 1-888-887-9840 to order a yearly subscription. Our inexpensive subscription rate is based on a congregation’s weekly worship attendance. We have intentionally kept the cost as reasonable as possible to make solid materials available to all congregations. Take an early "pre-preview" look at Sola's newOnline Worship Resource Site: a lectionary-based resource for Scripture lessons, lectionary inserts, children's bulletins, devotionals, text studies, prayers, hymn-planning, and much more! For more information on the site, including the pricing schedule for subscriptions, download a free brochure. Coming Advent 2013: Sola Online Worship Resource! We are doing something different from other sources out there, in order to provide our congregations with worship-support materials they actually need and use -- grounded in a sound, biblical Lutheran theology, and offered at a reasonable price. As we develop our new Online Worship Resource Site, we have a clear vision for what we are doing and what we are not doing. We're not using automated generic bulletin-making software, nor are we becoming a general music-licensing company. We ARE providing the kind of pre-formatted and flexible worship resources that many Lutheran congregations print every week, including: bulletin inserts, children's bulletins, devotional inserts, weekly lectionary text studies, liturgical clip-art, cover art, service settings, etc. We are also providing a wealth of worship-planning resources, including: seasonal suggestions, weekly hymn suggestions, lectionary summaries, prayers of the church, sermon starters, bulletin templates, powerpoint backdrops, and much more!